Many people think Allen Carr’s Easyway is simply a series of quitting drugs tips to help people quit. It isn’t. It’s as if people are lost in a maze. They want to escape but they don’t know the correct directions. Allen Carr’s method provides a map of the maze and simple instructions to help anyone get free. However, if you try to follow the instructions without first understanding the map, or you fail to follow all the instructions, you may never find the exit. 1. 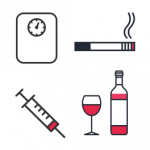 We must be very clear – Allen Carr’s Easyway organisation is not remotely judgemental on the issue of ‘drug use’. Neither does it endorse, encourage, promote, or approve the use of any illegal substance – but of course we are happy to provide advice to those seeking it on the questions raised. In the UK it is extremely common for cannabis/marijuana users to mix their drug with tobacco however, in other parts of the world, this is not the case. Whether you just want to stop smoking cigarettes or want to stop using cannabis/marijuana as well – if you mix cannabis/marijuana with tobacco, ‘first base’ is to stop doing so. 2. Separate your use of the two drugs. This does not mean that you should smoke a neat joint and a cigarette simultaneously (one in each hand) but that you should decide which you want to smoke. If you end up having one immediately after having the other – no problem. Separate the two a few weeks before you attempt to stop. If you want a cigarette during that period – do so – without making any attempt to cut down or control your smoking. If you want to smoke a joint during that period – do so – but ensure that you smoke it neat (you can use a pipe, a bowl, or hot-knife it – just be sure to never mix it with tobacco). 3. Over the past twenty years or so we’ve noticed more and more smokers that visit our stop smoking clinics actually started smoking at quite a mature age (in their 20s and 30s rather than in their teenage years). In most cases the way they become trapped is through smoking joints mixed with tobacco at parties. It never occurs to them that they are smokers until they find themselves smoking normal cigarettes in situations where joints are not available. Finally the penny drops and they realise that they need help to quit smoking. 4. Often heavy users of marijuana/cannabis have no idea that one of the main reasons for their heavy use can often be their addiction to nicotine. Because they only ever smoke tobacco when they mix it with marijuana/cannabis their addiction to nicotine can drive their consumption of both drugs. That’s not to say that they’re not addicted to marijuana/cannabis – merely that their consumption of marijuana/cannabis is further amplified by their addiction to nicotine. 4. So, having separated the use of nicotine and the use of marijuana/cannabis, which should (the person who wants to rid themselves of both) quit first? If you’re thoroughly fed up of smoking both and desperate to be free from both – then in all likelihood, stopping smoking (tobacco) using Allen Carr’s Easyway method is likely to set you completely free from both. Thousands of clients who have attended our stop smoking clinics have stopped smoking both (simultaneously) easily, permanently, without feeling deprived, and found it to be an enjoyable, liberating process. Far from feeling deprived or miserable they’re left better able to relax, better able to cope with stress, better able to enjoy social occasions, and enjoy life – free from the drugs. Those that fail to stop smoking marijuana/cannabis after stopping smoking tobacco using Allen Carr’s Easyway method, or those who subsequently decide that they also want to stop smoking marijuana/cannabis, can do so by using the method applied to that specific drug. 5.More and more cannabis / marijuana users are contacting us to help them get free from their drug. We provide ‘One to One’ sessions to deal with this (and any other drug) at our specialist clinics in London, England. These are currently the only clinics at which we are able to offer this service. The treatment has been so successful we are able to provide the same money back guarantee that we have offered with our stop smoking programme for the past 30 years. Easyway doesn’t focus on the downsides of smoking or cannabis – you know all about those already. Instead the method answers the question “what’s so great about being a smoker or cannabis user?” Understanding that is the key to being set free. There a number of ways of using the Allen Carr’s Easyway method choose the right one for you.